We asked SAI alumna Christina to tell us about her SAI Moment, a defining moment in her study abroad experience. I had my “SAI Moment” when I visited Ireland while studying abroad this past summer. 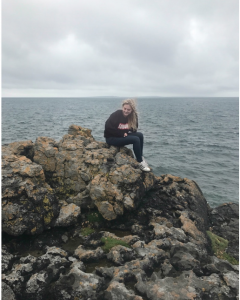 This trip was particularly special to me because I feel like I really got immersed in the Irish culture, which is so unique and interesting. 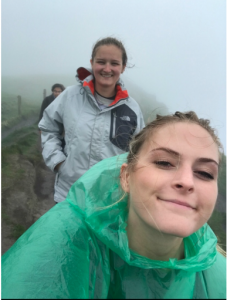 My roommate and I visited the Cliffs of Moher, and our tour guide said that it was the foggiest day that he had ever had on a tour (which is crazy, because he guided tours to the cliffs weekly). The wind was strong, it rained all day, and we couldn’t actually see the cliffs, but we still had an amazing time in this beautiful place. This moment really made me love the fun and unexpectedness of traveling, and all that you get to experience with it. My roommate Megan and I on the Cliffs! Christina is a SAI Ambassador from the University of Missouri- Columbia. She studied abroad in SAI Rome in Summer 2017.